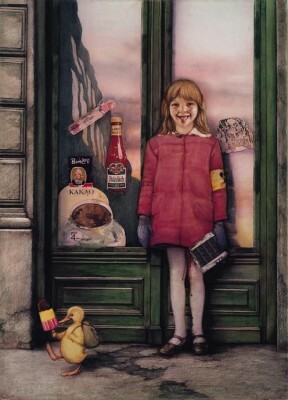 Gottfried Helnwein, about the subject of children in his art. The Austrian artist Gottfried Helnwein is well aware of the discomfort the public feels when confronted with images of children not represented as innocents but to whom a powerful sexual identity (and an awareness) is designated. In his work, and especially his paper drawings, he has created some of the most powerful and disturbing representations of abused childhood in history of art. We are not talking about the form of abuse commonly described in the penal code. By altering or removing the inbred pulsation that spurs us to stubbornly refuse or deny what we do not recognise, the manipulations and interferences (The Intrusion) adults perform on the social body of childhood are denounced. In the dancing school of that theatre Andreas and I started as children. Helnwein does not only limit himself to addressing the issue but tackles it forthwith without looking away or withdrawing. He tries to capture the essence, the strength deriving from it and offers it to the spectator whose certainties start to vacillate. In The doubting Thomas, a male character kneels in front of a young girl and rests his head on her lap in sign of abandonment, of absolute prostration. Also in Untitled (1993) both the recognition of the "fluidity" of childhood elusiveness and the desire to compress it in a fixed and reassuring environment is staged. In many of his paintings and photographs young girls are portrayed with their heads or hands (the sense of tacitility) almost entirely covered in bandages, a way of avoiding, through sensorial excision, all contact with the world or the possibility of getting in touch with it. In other words, the artist attempts to chase away once again the contagious and uncontrollable carnality that childhood senses are able to project onto it (see Beautiful victim II and Child of light, of which Helnwein has created many variations). However, Helnwein's ideas on the subject of childhood are more complex than this. The many images of children suffering (as seen in his recent series Angels burning), a disturbing form of suffering looked at in awe as the consequence of something we ignore the cause of (what else but not the sombre irrationality? ), also have the function of reawakening our already anaesthetised senses before the sufferings of the world.